Simulation driven design has long held great promise. This eBook provides new guidance on how to reap the most benefit from it. What is Mechanical Computer Aided Engineering (MCAE)? 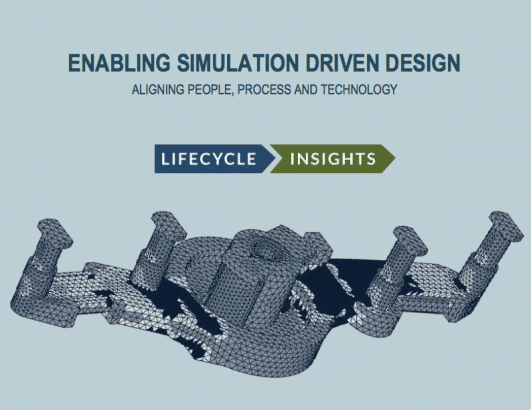 How Do You Best Enable Simulation Driven Design? This eBook is of most value to executives and champions responsible for the tactics of implementing a simulation driven design initiative. Managing product performance is a crucial aspect of any product development project. Today, you’ll be hard pressed to find anyone involved in engineering that disagrees with that statement. If you have prototypes fail in testing, it can have a devastating effect on the organization’s ability to launch or deliver that product. If a product breaks down in the field or in a customer’s hands, it can ruin a reputation or result in cancelled orders. When it comes to managing product performance, engineering organizations have lots of choices, many of which aren’t mutually exclusive. It is important to have good testing methods in place that close the loop on requirements. Groups of expert analysts now man the last steps of design release, running verification and validation processes digitally instead of physically. And while both of these competencies are vital to developing good products, neither has the ability to impact improving a design as much as a Simulation Driven Design strategy. You see, a Simulation Driven Design strategy aims to conduct analyses during the conceptual and detailed design phases of development. The results provide greater insight to the engineers making the decisions for that design. Armed with more information about what variables affect performance, engineers can make better decisions. That can produce products that are lighter, faster, cheaper, and better differentiated. influence fast changing designs. Deploy difficult-to-use software tools, users will struggle with their tasks. So while many agree with the fundamental idea behind a Simulation Driven Design strategy, many still struggle with its tactical execution. Providing guidance on that topic is the purpose of this publication.